Share the post "Album review: DRIVING MRS SATAN – Popscotch"
Does the world need an album of metal covers by acts like Helloween, Metallica, Iron Maiden, Anthrax, AC/DC, Black Sabbath, Slayer and Faith No More? 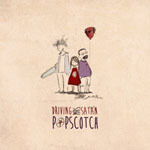 You might not think so, but when it’s something as unique as Popscotch, by Italian indie alt / pop outfit Driving Mrs. Satan (Claudia Sorvillo – vocals, Giacomo Pedicini – double bass, and Ernesto Nobili – acoustic guitar/ backing vocals) the answer in an emphatic ‘yes’. Because Driving Mrs. Satan don’t just ‘cover’ classic metal tracks such as ‘I Want Out’, ‘Hell’s Bell’s', ‘Can I Play With Madness’ and’ Never Say Die’, they totally deconstruct them and reinvent them as shimmering, playful acoustic indie pop in a style not a million miles removed from the short lived brilliance of Oh Laura. Perhaps best appreciated if you have a familiarity with the originals, but that’s far from a prerequisite and it would be a real blast to see the Driving Mrs. Satan open for one of the aforementioned bands. They’d go down a storm, guaranteed. Driving Mrs. Satan have an album here that metal fans will either like with a ironic smile whilst listening to the music or burn as a sacrifice at the next Manowar gig. Why? Well they cover metal classics from the likes of Anthrax, Metallica and Iron Maiden in an indie pop style, often verging into easy listening. The soothing vocals of Claudia Sorvillo sound perfect as she sings ‘Can I Play With Madness?’ or the Sabbath classic ‘Never Say Die’. Most bizarre was listening to Motorhead’s ‘Killed By Death’ which sounds so musically soothing despite the lyrics, as the band play double bass, cello and acoustic guitar. I actually think Lemmy would approve of this version! They even have the guts to cover a Slayer tune (‘South Of Heaven’) and AC/DC’s ‘Hells Bells’ which sounds like some ethereal folk song. If nothing else listen to Metallica’s ‘Battery’ given the soothing indie pop treatment on the band’s YouTube channel. This entry was posted in ALBUM REVIEWS, ALBUM REVIEWS (Mobile), All Posts and tagged acoustic, album, Black Sabbath, Driving Mrs Satan, Helloween, Iron Maiden, Judas Priest, metal, Metallica, pop, Popscotch, review, rock. Bookmark the permalink.